As the best pre-workout supplement on the market, Isagenix AMPED Nitro contains a lean muscle building compound of creatine, enzymes, and other gut-busting supplements to maximise the effects of any workout. 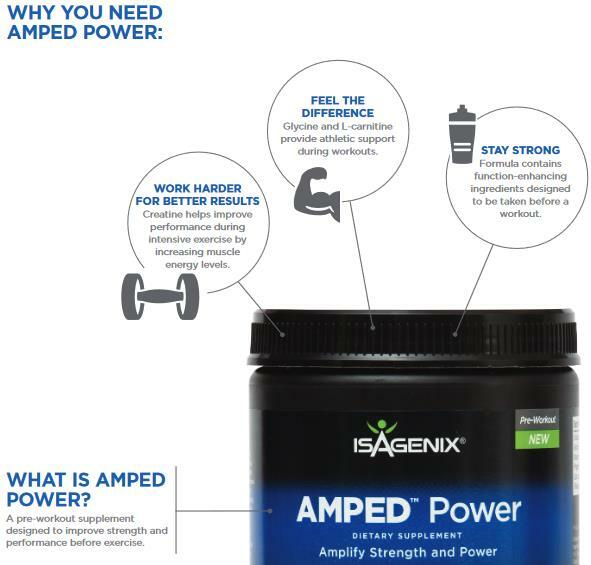 Combine with Eshots, AMPED Nox and AMPED Recover for maximum benefits. Watch the video below for more information on how to get the most from the range. How Can the AMPED Range Help You? Designed specifically as a pre-workout supplement, Isagenix Amped Nitro helps unlock your strength, boost your energy, and prepare your body for exercising, playing sports, or hitting the gym for the most grueling of workouts. Whether you’re hitting the mountain bike trail or hitting the weights, one serving of AMPED Nitro is all you need to get the most out of any and all physical pursuits. 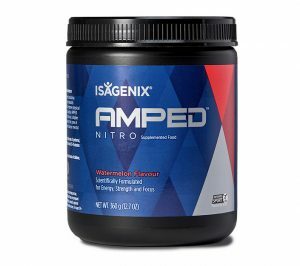 Athletic Support – With glycine and L-carnitine, AMPED Nitro provides excellent athletic support for any type of workout. Achieve Better Results – The creatine utilised in AMPEDNitro helps increase muscle energy and improve performance during the most intensive exercises. Stay Strong All Workout Long – Full of function-enhancing ingredients, the AMPED Nitro formula will allow you to stay strong all workout long when taken prior to hitting the weights or mats. Isagenix AMPED Nitro is also soy, dairy, and gluten-free. Alternatively, contact Nicole at info@isaelite.com.au or call her on 0413 254 398. Your query will be answered within 12-24 hours. How Can You Buy Isagenix AMPED Nitro? Sign up with Autoship to take advantage of wholesale prices and fast delivery from the closest warehouse in Australia or New Zealand to your doorstep. Change your scheduled order or make additional orders whenever it suits you. You can cancel Autoship via email or phone at any time with no contracts or strings attached. You can purchase any of the Isagenix products at full retail price if you prefer not to sign up and take advantage of the cheaper wholesale prices. Remember, if you are not completely satisfied with your products you can send it back for a full product refund. All products for your first order are covered by a 30 day money back guarantee, you have nothing! Full details can be found here.